And you smiled at me in the heat of the October nights. And marvelled, as you led me, hand in hand, through the paint-puzzle-story-naptime rituals of your days. It caught my breath, to glimpse the child you were becoming. Two years in a gray, wet state. Your school, the rain, the berries, the skating, the cousin you came to know. Only a foot below me. You face the camera, and smile; I love those straight, white teeth. I look to find myself in you but you are much more vibrant, your eyes are green, not blue like mine; you are not shy, like I was. 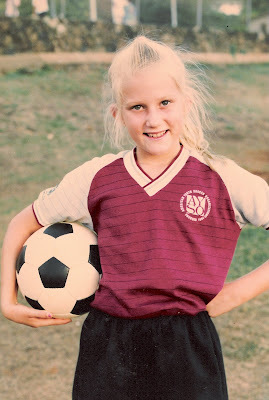 You pose in the black and red soccer uniform of the "Razor Blades", a ball tucked under one arm, your hair's tied back in regulation style, rebellious wisps escaping where they may. I appreciate that in this game you find a challenge, when everything you do comes so easily. Now I can barely fit you on my lap. Will you do as I do now? Will you kiss the nape of his neck and tell him how much you love him? Thanks for sharing that special poem, Metta. It's beautiful.